Inevitably, there comes a time in a parent’s life when this happens: you’re at the store, looking for groceries, pass the toys or sweets section and your child asks for a treat. You explain him or her in a nice and calm way that you can’t buy it, and the screaming tantrum begins. What do you do then? 1. Don’t buy them the desired object. This kind of behavior would feed itself from a parent’s fear of public embarrassment or, it may be that your child is just tired and looking for a way to draw your attention. 2. Do your best in keeping composure and showing patience and love. Bear in mind that your child has not yet developed ways to communicate, lacks control or coping mechanisms. She entirely relies on you to learn how to react to frustration, anger, etc. Their purpose isn’t to annoy you; this is just another step in discovering the world. 3. Consider leaving the store. The child may notice your embarrassment and only aggravate the behavior. 4. Once you are out of the store, try figuring out what is the real reason behind her behavior. Talk to your child as an equal, look into her eyes, give her a tight hug and explain in a calm voice why this kind of behavior is not acceptable. Explain the consequences if this would happen again (parents start going to the store without her, doesn’t get the toy etc.). 1. Build with your child a list of expected behaviors in a store (which you should repeat before entering). Examples include: we keep our voice low, we don’t touch the merchandise, etc. 2. Adding to that list, is creating an if-then scenario. If you start crying, whining etc., this will happen… Keep your word in taking away his toy, game (whatever the “effect” is) otherwise, she might think this is an acceptable behavior. I read a comment on Quora about this topic, a wonderful example: A father was shopping with his child and the child was asking for candies. When the father said no, the child started screaming, kicking and crying. The father left the groceries and hugged the child tight. After a few minutes, her behavior turned into crying until stopped completely. That is one of the most beautiful examples I have read, about a parent showing unconditional love to his child even in a time of anger. 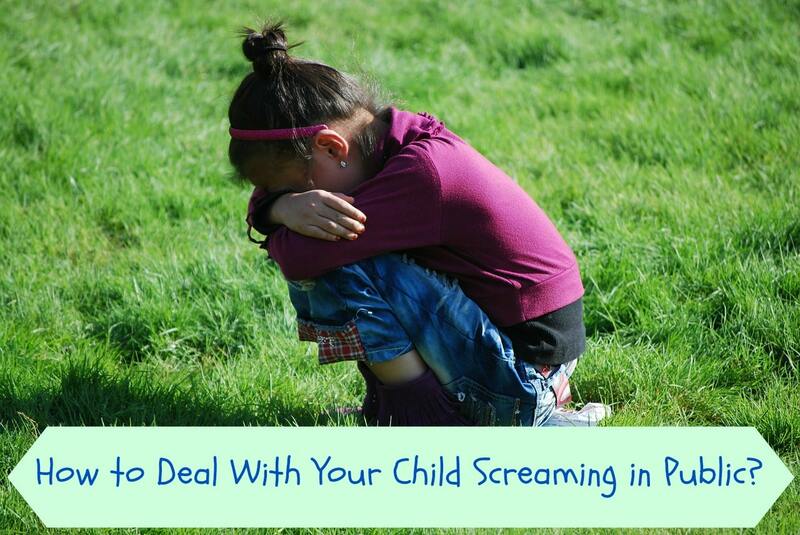 How do you deal with your child screaming in public? Parenting Apps: How Your Mobile Can Help You Parent! Should Your Baby Sleep On A Soft or Firm Mattress? These are great tips! It is important to remember to stay calm because getting frazzled will escalate the problem. Great tips and yes have totally been there int he past with both my girls and agree with dealing with when it happens by removing them from the store first and foremost. That is a great tip. When this first happened, I was so embarrassed, my face was so red!! I need to change my mindset to not be embarrassed about this! Oh boy do I have a screamer on my hands! I’ve had to leave a store completely a time or two due to it. I have found the ‘hug’ method to work well. I know I’ll need this sooner or later! I know I’ll need this eventually! Right now, baby wearing saves me so much! I love that example. I think the only other thing to add is that everyone has been there. So stay calm, and remember, you’re not alone. Great tips! I think it’s hard to remember you’re not alone when that is happening – especially because everyone is looking your way! I love the example you shared of the dad. I get agitated when my child freaks but I try to stay as calm as possible. Speaking in a hushed calm voice usually does the trick. Although I once bailed from a store because I just didn’t want to engage in that behaviour and obviously that wasn’t the best time for my child to be out and about. Definitely been there. I’ve had to leave Target twice because of tantrums–once for each child. I agree with all of your tips. Sometimes, the stimulation is just too much for threenagers! Such a great list. This is advice that anyone with young children could glean from. All great ideas. I have two nieces and a nephew, so I definitely know about public meltdowns. Thanks for sharing! Hi Marina, great tips, but will I get stoned if I say that I honestly can’t remember either of my two having a public meltdown?…. The secret was never taking them out in public or having a really bad memory!… Joking aside I’m not sure how we managed it, but I do thank my lucky stars as I would probably have reacted in a similar fashion! Great tips!!! You definitely don’t want to give in to a screaming child.